Big Sandy Camp is seeking 45 fun, exciting Christians to join our 2019 summer staff. Join us as we celebrate 60 years of ministry Touching Hearts and Changing Lives through Jesus Christ. Staff training starts June 1st and camp runs through August 10th for most staff. To apply click on the Summer Staff Application button below and we’ll get in touch with you to set up an interview. We ask all of our selected summer staff to provide a Connection List of 20 names and addresses of people who believe in the ministry they are doing for the summer. Big Sandy uses this list to contact people about prayer requests for BSC, opportunities to support our summer ministry, and updates about salvations and life changes at Big Sandy Camp. Staff are all paid equally regardless of the amount given by donors from their connection list. Ideal staff for Big Sandy Camp are 18 years old and have graduated from high school. 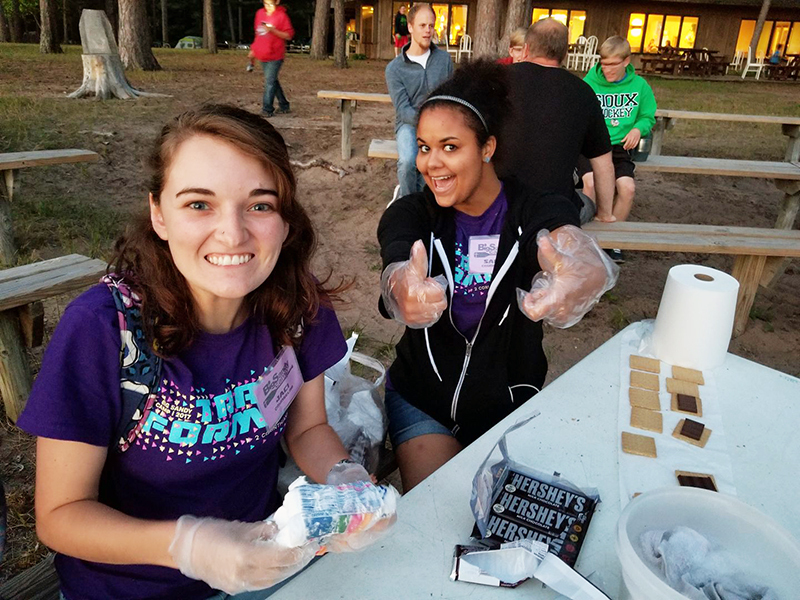 They have a deep, personal relationship with Jesus Christ, a strong work ethic, and a fun and energetic attitude towards camp. Staff should be able to lift 30 pounds and carry them 10 feet. Staff should be able to walk 2 miles comfortably. Summer staff must agree to a moral contract that includes prohibiting drinking or smoking during their time on staff, even during their time off. Primary Responsibilities: Providing a safe and fun beachfront experience for campers and guests. Managing lifeguards, summer staff, and volunteers at the waterfront. Leading rescues and safety drills as well as staff exercises at BSC. Leading a cleaning team on cleaning days. Ensuring safe operation of the BSC Waterslide. Helping guests with boating and other water activities. Secondary Responsibilities: Helping with games and activities outside of the waterfront, serving on dish teams and cleaning areas. Serving as a cabin buddy. Helping with maintenance projects. Primary Responsibilities: Lead campers through activities, Bible studies, games, and meals. Help to lead activity areas for guest groups, serve on dish teams, and cleaning crews. Keep a safe and fun cabin space for campers to engage in. Secondary Responsibilities: Support camp in maintenance, kitchen and accommodations areas. Primary Responsibilities: Lead campers through activities, Bible studies, games, and meals. In addition help to lead activity areas for guest groups, serve on dish teams, and cleaning crews. Keep a safe and fun cabin space for campers to engage in. Primary Responsibilities: Work on maintenance projects and building maintenance projects as they arise. Operating equipment as needed; tractor, wood chipper, riding lawn mower, weed whip, power drills, rug doctor, floor machine, etc. Must have a valid driver’s license. Secondary Responsibilities: Assist in accommodations, kitchen and program areas as needed. The Nyack College Scholarship is $1200 and the scholarship is no longer subject to grant/scholarship caps. Please contact the Nyack College office for further details and conditions. Primary Responsibilities: Preparing and serving food. Maintaining a clean and safe work environment. Ensuring that health codes and systems are followed. 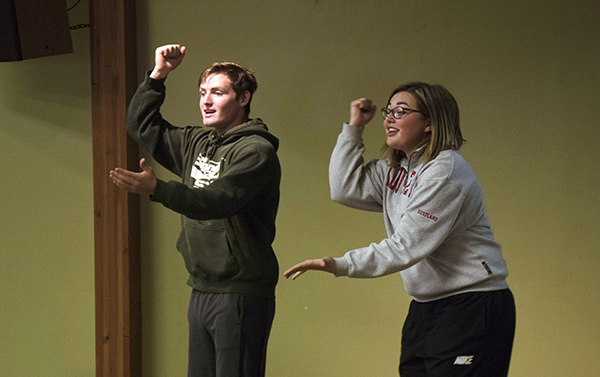 Secondary Responsibilities: Supporting the program department in activity areas, skits, and games. Serving as a cabin buddy. Helping with cleaning and maintenance projects as needed. Primary Responsibilities: Cleaning and maintaining the dining hall. Emptying trash cans around camp. Leading the dining hall cleaning team. Supporting Student Ministry Team members assigned to accommodations. Operating some equipment as needed; riding lawn mower, weed whip, power drills, rug doctor, floor machine, etc. Secondary responsibilities: Helping with maintenance projects, acting as a cabin buddy, helping with program and kitchen areas as needed. Primary Responsibilities: Running the various games and activities around camp including but not limited to; The giant zip line, climbing wall, snack shop, craft shop, petting farm, knocker ball, field games, wacky Olympics, beach party and night games. Supporting chapels with skits, games, and activities. Serving on dish teams and cleaning crews. Secondary responsibilities: Helping with maintenance projects, supporting the kitchen as needed, serving as a cabin buddy. Host meals, other duties as assigned. Primary Responsibilities: Lead and manage Activity Staff and Student Ministry Team members as well as volunteers as they complete duties in the following areas: snack shop, games, and activities including the giant zip line. Lead devotions for Student Ministry Team members each day. Serve as the MC for chapels and Beach Party. Deal with issues as a member of the leadership team. Secondary Responsibilities: Serve on dish crews and cleaning crews. Help supervise volunteers in other areas of camp. In the absence of the Head Male Counselor, fill in as a support to the Male Counselors. Primary Responsibilities: Lead and manage Activity Staff and Student Ministry Team members as well as volunteers as they complete duties in the following areas; snack shop, games, and activities including the giant zip line. Lead devotions for Student Ministry Team members each day. Serve as the MC for chapels and Beach Party. Deal with issues as a member of the leadership team. Secondary Responsibilities: Serve on dish crews and cleaning crews. Help supervise volunteers in other areas of camp. In the absence of the Head Female Counselor, fill in as a support to the Female Counselors. Primary Responsibilities: manage and care for the camp gift shop. Keep a clean and organized storefront. Support camp by completing administrative duties in the camp office. 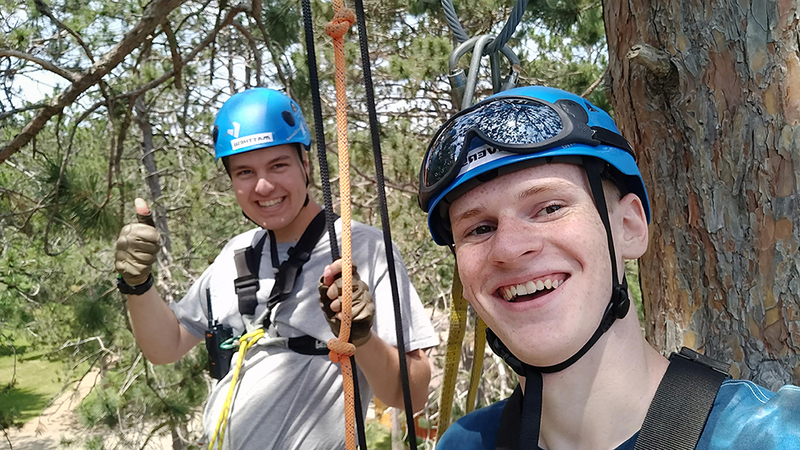 Answer the phone and direct calls to full time staff members, assign campers to cabins, register campers for camps, and support the Guest Services Director as needed. Secondary Responsibilities: Serve on a dish team and cleaning crews, help with maintenance and program responsibilities. Serve as a cabin buddy. Primary Responsibilities: Provide support, encouragement and discipline for the Male Counselors. Manage campers in crisis who need more support than the male counselors can provide. Assist camp in multiple activity areas including the climbing wall, snack shop, games and chapel times. Serve as the MC for chapels and events at camp. Provide biblical leadership for the staff by leading devotions and supporting the Guest Services Director and Media Director in planning offsite events. Secondary Responsibilities: Lead cleaning crews and dish teams and support camp in the kitchen and maintenance departments. Primary Responsibilities: Provide support, encouragement and discipline for the Female Counselors. Manage campers in crisis who need more support than the female counselors can provide. Assist camp in multiple activity areas including the climbing wall, snack shop, games and chapel times. Serve as the MC for chapels and events at camp. Provide biblical leadership for the staff by leading devotions and supporting the Guest Services Director and Media Director in planning offsite events. Primary Responsibilities: Providing a safe and fun beachfront experience for campers and guests. Ensuring safe operation of the BSC Waterslide. Helping guests with boating and other water activities. Leading the waterfront in the absence of the Waterfront Director. Primary Responsibilities: Preparing and serving food. Maintaining a clean and safe work environment. Ensuring that health codes and systems are followed. In the absence of the Food Service Director, serve as the Director of the kitchen. Primary Responsibilities: Taking video and photos of action at BSC. Helping to edit and cut videos. Creating end of the week videos. Uploading pictures, videos and status updates to camp’s social media accounts. Running sound and slides during chapel sessions. Secondary Responsibilities: Serving on dish teams and cleaning crews. Serving as a cabin buddy. Primary Responsibilities: Providing a safe and fun beachfront experience for campers and guests. Managing lifeguards, summer staff, and volunteers at the waterfront. Leading rescues and safety drills as well as staff exercises at BSC. Leading a cleaning team on cleaning days. Ensuring safe operation of the BSC Waterslide. Helping guests with boating and other water activities. Deal with issues as a member of the leadership team.